The world-class San Antonio Park horse race track was formally opened Saturday with the blessing rites held inside the Nenita Farms in Marapangi, Toril, Davao City. The blessing was led by Dona Nenita Floirendo and his sons Antonio “Tony Boy” Floirendo Jr. and Ricky Floirendo, chairman and senior vice president, respectively of the Anflorcor Group of Companies. Also present were Anflocor president Alexandar Valoria, Vincent Floirendo, Board of Directors Marissa Floirendo and Linda Lagdameo, Vice-President on Corporate Affairs Maricris Brias and Davao del Norte 2nd District Representative Anton Lagdameo, who even helped Fr. Jobel ride at the back of the horse to bless the whole race track with his holy water. Mayor Rody Duterte and Vice Mayor Pulong Duterte were represented by City Councilor Myrna Dalodo-Ortiz and City Tourism Officer Lisette Marquez, respectively. “We are truly blessed that we have this one of a kind world class oval here in Davao, which is the first outside of Manila” said Davao Horse Club president Mike Dizon. “San Antonio Park is a 2-kilometer oval race track that can give the Sta. Ana Race Track in Carmona, Cavite a run for its money,” Dizon added. San Antonio Park is named after the late founder Don Antonio Floirendo Sr., an avid horse breeder and a strong supporter of the 15-year old Davao Horse Club. “He was our honorary chairman,” said DHC spokesman George Walter Misa, who owns 14-year old Quilin Prince, the oldest living race horse. The Floirendos also own the Empire Joy Stud Farm inside the Nenita Farms, which have been breeding pure Thoroughbreds (race horses) of famous winning stock from England, US and Australia in the same property that rolls gently up to the foothills of Mt.Talomo for 40 years now already. 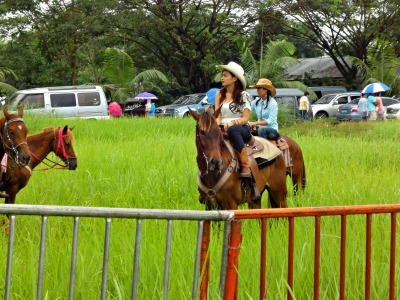 A grand horse fun race was immediately held yesterday featuring entries from Davao, Digos and Malaybalay, Bukidnon. The blessing of the San Antonio Park also coincided with the opening of the “Kadayawan sa Nenita Farms” Agri-Business Fair that showcased all the companies managed or invested by Alflocor. Among them are the Nenita Farms, Tagum Agricultural Development Company Inc. (Tadeco), Davao Agricultural Ventures Corporation, Davao Packaging Corp., Anflo Banana Corp., San Vicente Terminal and Brokerage Services, Panabo Trucking Services Inc., Damosa Land Inc., Pearl Farm Beach Resort, Nestfarms Inc., Kensington Ventures Inc., Pioneer Trading and Supply Inc., United Financing Corp., Kalayanaan Broadcasting Samal, CJ Toyota Tshuso Phils. Inc., and The Amaryllis in Quezon City.